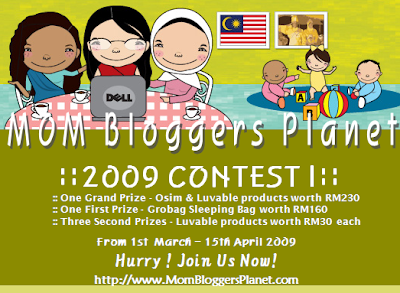 Mom Bloggers Planet Contest !! Closing date and time is by this midnight !!! Sempatkah dakoooo . . . ??? 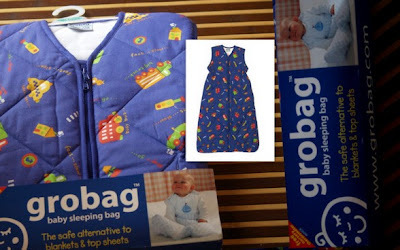 What is a grobag® baby sleeping bag? A grobag® baby sleeping bag is a wearable blanket that will keep your baby at a comfortable temperature all night long. A safe and sound night’s sleep for your baby means peace of mind and more sleep for you! Nak tengok pic sila ke link Mom Bloggers Planet tu yer . HOW to participate? It’s easy. Just follow the steps below and the prizes could be yours! 1) Write a creative short entry in your blog (in Bahasa Melayu or English – up to you) about MomBloggersPlanet, the BlogDirectory and this contest. Which prize do you like and why? 4) Tell us about your entry by leaving a comment with the link to the entry here. This contest is only opened to Malaysian bloggers only. You must already registered to the BlogDirectory and already submitted your mommy blog (if you haven’t, please do so – it’s free). The contest starts on 1st March 2009 and ends on 15th April 2009. You must put the required links in your entry. Else, it will be disqualified without notice. Judge’s decision is final and no correspondence will be entered into. Winners will be announced in the featured columns and also will be contacted via email. So here comes my entry for this contest . . .
– – – > I get to know about Mom Bloggers Planet thru one mommy blogger’s blog . (sorry i couldn’t remember who but she is the purpose i get to know about this site n contest .. thanks to her) . This site is owned by Little Mama and i have been following her blogs since 2 weeks time . Her blogs are wonderful and professionally-looked . Little Mama’s idea to create this blog ( Mom Bloggers Planet ) is stunning and brilliant which unites all blogger moms in Malaysia in one place , where they can share their opinions and thoughts . The BlogDirectory is a perfect one-stop to list all moms’ wonderful blogs . I knew it by reading the whole part of Mom Bloggers Planet and i decided to list my blog there once and for all . This contest which ‘ tickles ‘ my heart with its displaying ads from time to time . I keep submitting this entry even though today is the last day ! Actually all the prizes attracted me a lot but the biggest attraction is the Grobag . The Grobag is very suitable for my kids because we used to travel frequently . No need to bring or find blanket anymore . The design is also neat and comfortable . Done !! Gud Luck to me and all moms who contribute in this contest yah ! Next: Next post: Lesen P itu Kini Milikku . . .